The Bill Reid Gallery of Northwest Coast Art presents AKOS, the monumental works of spray can art by Haida artist Corey Bulpitt, on now until September 14th. 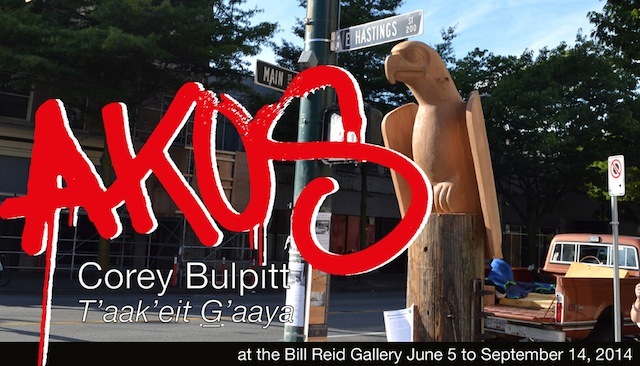 AKOS is Corey Bulpitt’s graffiti tag and his Haida name, Taakeet Gaaya, translates to “Gifted Carver”. Both names reveal two art forms that have successfully come together through this exhibition. For over 20 years, Bulpitt has been developing his skills as an artist – beginning as a graffiti artist in the 90s. At the age of 15, he immersed himself in DJing, MCing, breaking and graffiti, key elements of Hip Hop culture. At age 20, he returned to Haida Gwaii for a four-year apprenticeship under Haida master carver Christian White. His mentorship included the study of Haida social structure, clan structure, oral history, 2-D art and 3-D carving, ancestral music and dance. Graffiti and Haida design share many of the same artistic values: continuous flow that expands and compresses, balance in design, colour, positive and negative, and narrative which is reflective of society and social status. The art is explicitly connected to music. In both Hip Hop and Haida cultures, the expressions are all inter-connected. You cannot have one without the other. I first toured the Bill Reid Gallery in 2010 with Reid’s widow, Dr. Martine Reid, two years after it officially opened in 2008. Dr. Reid told me that Bill was “breaking boundaries always” and he hated to repeat himself. I think this exhibition is a perfect fit for the gallery, not only representing the breaking of boundaries but the fusion of cultures, spanning generations, and opening the door for inspiration and expression. The Bill Reid Gallery of Northwest Coast Art is located at 639 Hornby in Vancouver, just off Georgia. It is open Wednesdays through Sundays from 11:00am to 5:00pm. Admission fees apply. Follow along on Facebook and Twitter for more information.